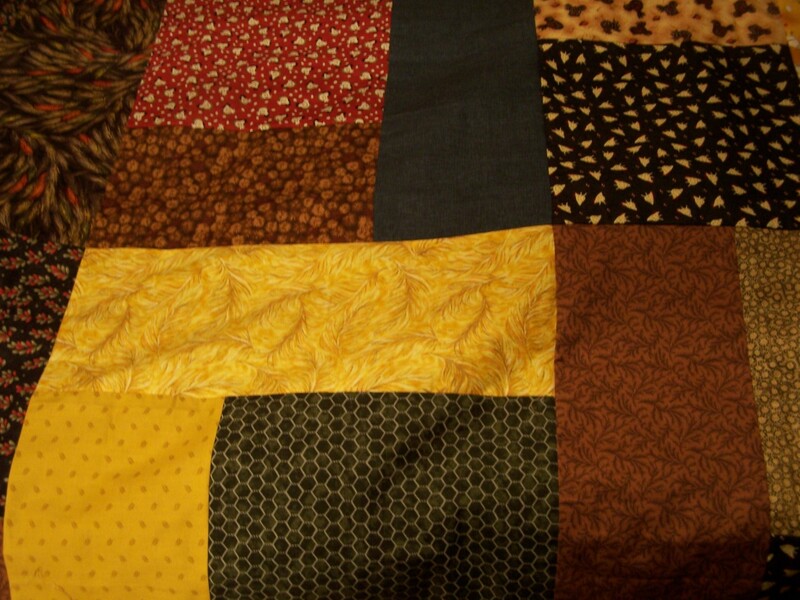 I have been working away on some of my stash quilts. I’m still stitching the binding on my first Gracie’s Star quilt. A bit more to go, a label, and it will be a finish. I’m hoping to have that done before this year ends. 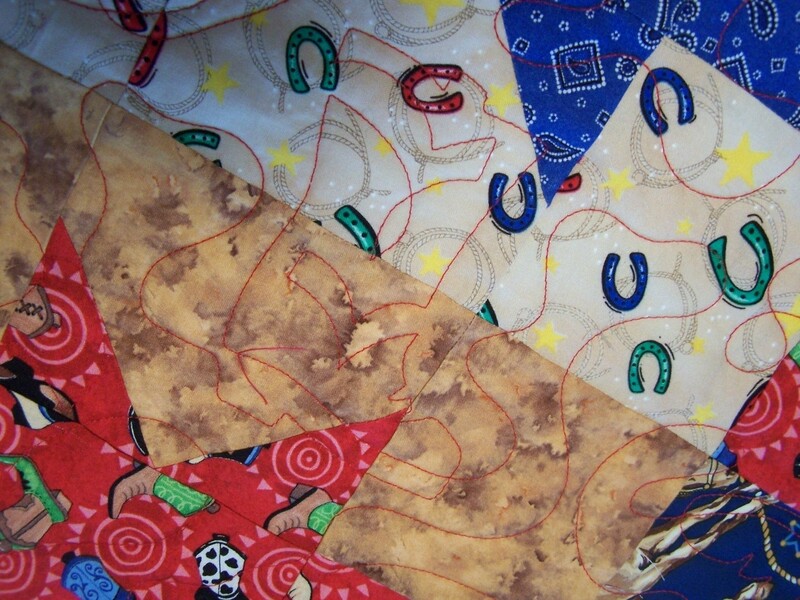 I really enjoyed making that quilt, so when a friend asked me to make a commissioned baby quilt for her, I thought it would be the perfect choice for to showcase these western themed fabrics I already had on hand. And, the pattern clearly states you may make them for personal use, OR for profit…so no copyright worries. Gotta love that. If you like the pattern, you may purchase your own at Quiltin’ Tia. I’m not affiliated in any way. Just a a happy customer. And now, the quilt. 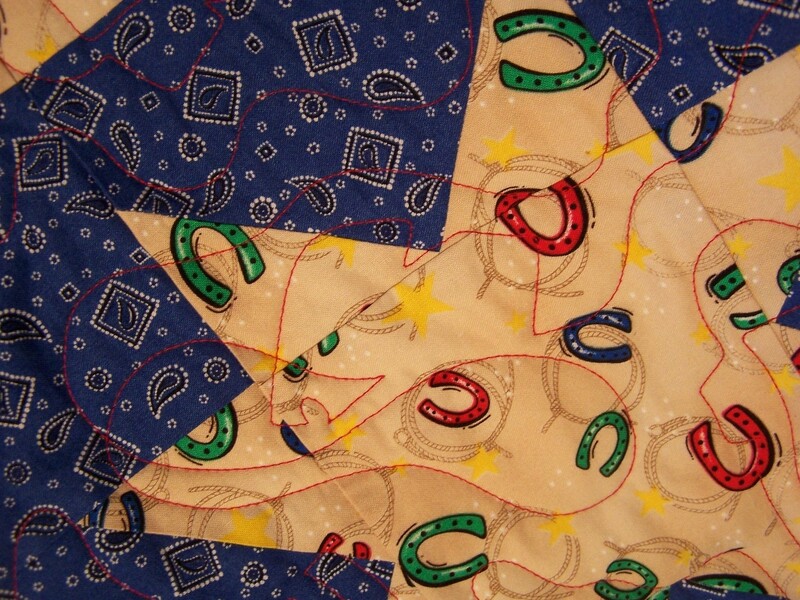 I quilted it with the Stetson & Boots panto from The Pattern Man. I used red Signature cotton thread. See the boots and hats? I use this pattern frequently and it stitches out nicely, and fairly quickly. 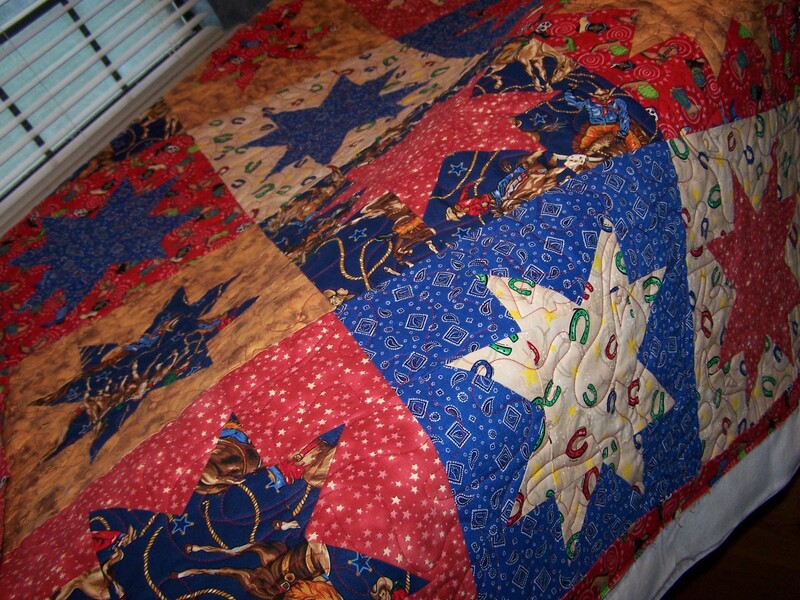 I used Quilters Dream “Dream Angel” flame retardant batting for the first time. I fell in love with the feel of this batting as soon as I took it out of the package. So soft. I will definitely use it again. 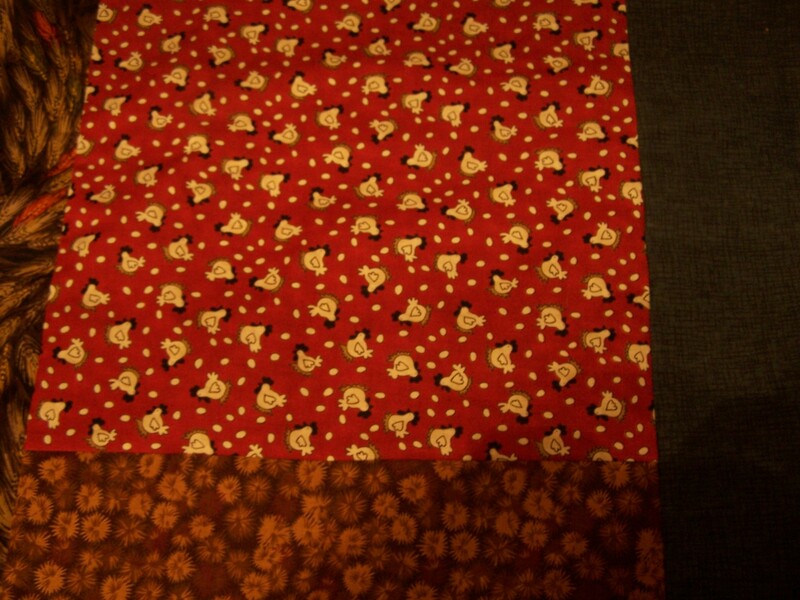 I also did my first ever binding on the longarm. It went pretty well. I will definitely do that again, as well. Yesterday, I sewed all day long, just for me. 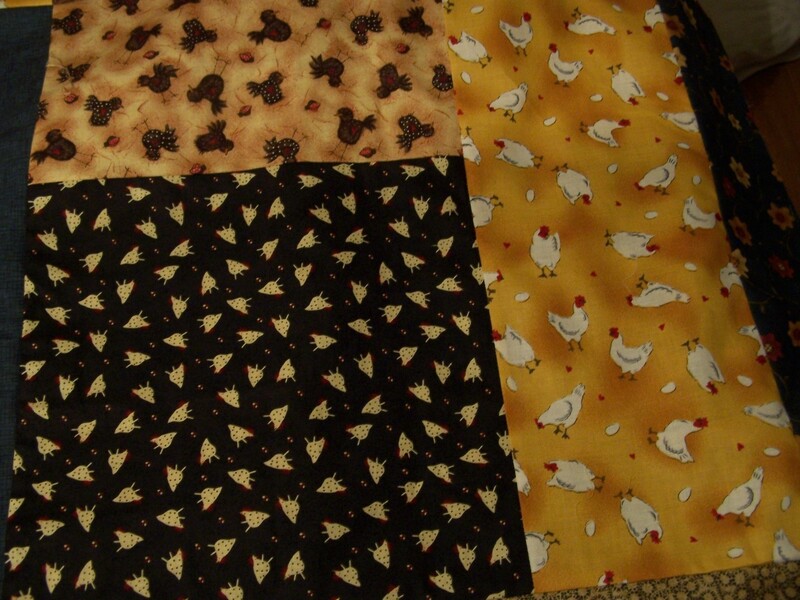 I needed some instant gratification, so I finally pulled out that stash of fat quarters that has been waiting to be made into a chicken quilt. I just used the Turning Twenty pattern, and now I have another flimsy to be quilted. A few little peeks at it. It’s not my usual color choices. Mostly browns and golds…very warm, for the most part. I think it will look lots better after quilting. 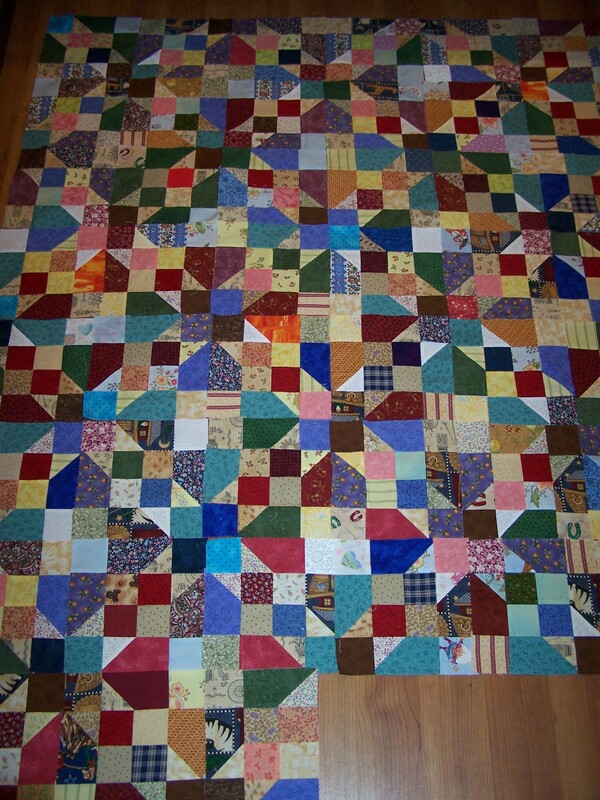 And, I think I am just three and 1/4 blocks away from having enough blocks to make my mom a decent size lap throw. This is Bonnie Hunter’s Oklahoma Backroads pattern, and I have been making these blocks using the leaders/enders method from her site. I went all out scrappy with this one. I think the next scrappy I make might be a bit more planned, rather than using any and everything. I am only working Monday and Tuesday this next week. Then, I am off on vacation! Yes! Between the holiday days, my vacation days, and the weekends, I will have eleven days off. I hope to get more done on my projects during that time. I am really looking forward to it. And that concludes my stash quilting report for this week!